Columbia’s global campaign to feature employees and Chairman, Gert Boyle; will be largest in company history. 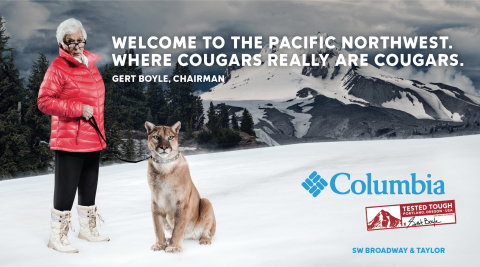 PORTLAND, Ore.--(BUSINESS WIRE)--Columbia Sportswear (NASDAQ:COLM), today launched “Tested Tough,” a new long-term, global brand platform, inspired by the company’s Pacific Northwest heritage and the original Tough Mother campaign that featured current Chairman, Gert Boyle, and her son current CEO, Tim Boyle. Columbia’s “Tested Tough” global campaign also marks the return to advertising of Columbia’s 91-year-old matriarch and Chairman of the Board, Gert Boyle. For many years, she ensured the product quality was up to her stringent standards by testing it in the harshest and most surprising of conditions on her son. Today, it’s no longer just CEO Tim Boyle testing product at his mother’s forceful behest. It’s every Columbia employee who comes to work in the rain-soaked, snow-covered, wind-beaten Pacific Northwest, and every employee who heads to the mountains, lakes, rivers, and trails on the weekends. Mrs. Boyle once famously said, “It’s perfect. Now make it better,” and this mantra is reflected across the campaign in a stamp that bears her signature. The stamp is Columbia's promise that its products have been “tested tough” by Columbia employees and live up to the high standards of Mrs. Boyle. “We’ve always known that if our product passed my tests in the Pacific Northwest, then it would pass people’s tests as well,” said Gert Boyle, Columbia Sportswear Company’s Chairman of the Board. The global campaign will kick off in early October, with broadcast, print, out of home, digital, retail and social elements rolling out in 63 markets across Europe, Asia, South America and North America. 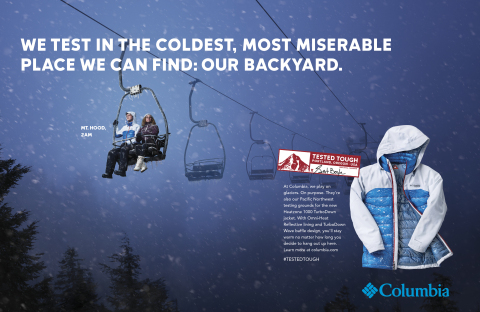 Social: To bring #TestedTough to life, Columbia has created a digital campaign hub at Columbia.com/TestedTough. Ever-evolving, it will host all #TestedTough content and related social campaigns. Most importantly, the site will serve as a destination for consumers to share their #TestedTough moments, by uploading a photo directly or tagging a post on Facebook, Twitter, or Instagram. Outside Magazine Partnership: To launch the work in print, Columbia partnered up with the leading active lifestyle publication, Outside Magazine, taking over their Winter Buyer’s Guide by running a faux cover (the first ever for Outside) as well as running additional impact placements that further bring the #TestedTough story to light. Out of Home Advertising: High impact out of home placements will be showcased in wallscapes, billboards, transit shelters, and station dominations across the globe. Digital: The fall campaign will include targeted local and national outreach that includes ads triggered by weather based on the local markets and their weather conditions. It will also include a heavy mobile program that will cover geo-fencing retailers, weather triggered units, and mobile video. The brand agency behind this campaign is North, based in Portland, Oregon, USA. To learn more about “Tested Tough,” please visit http://columbia.com/testedtough. Columbia, the flagship brand of Portland, Oregon-based Columbia Sportswear Company, has been creating innovative apparel, footwear, accessories and equipment for outdoor enthusiasts since 1938. Columbia has become a leading global brand by channeling the company's passion for the outdoors into technologies and performance products that keep people warm, dry, cool and protected year-round. To learn more, please visit the company's website at www.columbia.com.